Colour blindness (which experts call more accurately “Colour Vision Deficiency”) is the inability to see some colours or to tell some apart from others. The condition affects more than one in 20 males and a smaller but significant number of females. We can see because of receptor cells at the back of the eye called rods and cones. Colour is seen via the cones, which distinguish red, green and blue. In some people, one kind of cone is not working, like a colour TV set on the blink. The main cause is genetic – you get it from your parents or grandparents. 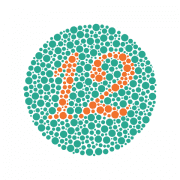 But colour blindness can also result from disease and accidents. Some causes we know about include: an acquired brain injury; eye diseases such as macular degeneration, glaucoma and diabetic retinopathy; some drugs; and vitamin A deficiency.